Many water management decisions, such as environmental flow requirements and water supply allocations, are based on numerical “water year type” designations. Water year type designations vary by region and index, but most are defined by some measure of runoff in the current water year compared to average historical runoff, with numerical thresholds categorizing year types. Climate change is anticipated to alter the timing and volume of runoff, and change the relative frequency of water year types as presently defined. California’s Sacramento Valley and San Joaquin Valley Indices are used as a case study to examine climatic changes. These indices provide a framework for allocating and transferring water among users. Streamflow estimates for 1951–2099 from the climate-forced Variable Infiltration Capacity hydrologic model are used to estimate potential changes in runoff and water year type frequency, using six global circulation models for the A2 and B1 emissions scenarios. 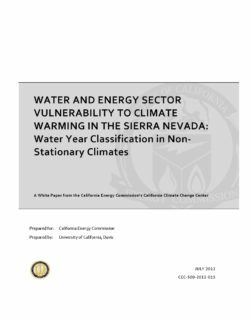 Results vary by emissions scenario and global circulation model, but indicate that critically dry water years in the Sacramento Valley and San Joaquin Valley are expected to be about 8 percent and 32 percent more likely by the latter half of the twenty-first century, respectively, if water year type definitions remain unchanged. If current water year type thresholds are maintained, more years will be classified as dry and less water will be allocated for environmental outflows, perhaps failing to provide adequate hydrologic variability to support species, habitats, and ecosystems. If thresholds are redefined to reflect the historical distribution of year types, the burden of climate change falls to consumptive users and water exporters. This case study illustrates how water policy and allocation frameworks were designed assuming climatic stationarity, and that adapting water policy (or maintaining the status quo) affects which users bear the burden of climate change.